Our highly-qualified safari guides are professionally trained in the wildlife, ecology and cultures of each safari destination covered in our Safari catalogue. 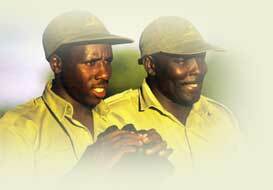 They have an in depth knowledge of the African Bush and are committed to providing safe and enjoyable game-viewing. They understand and cater toward your every need & interest, and provide an overall wholesome experience on every trip to Africa. Each Safari Guide has a deep-rooted commitment to conservation and eco-tourism. They enjoy what they do and go out of their way to develop excellent relationships with each Safari Guest. Hospitality is a second-nature in the African safari industry, as you will see when interacting with the local cultures throughout your safari. Our Safari Guides are a fine specimen of the true African Hospitality. 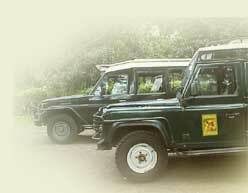 Africa Safaris selects professional guides in every country we serve. As always, our main focus is on personalized safaris, so as a special service for our safari guests, Africa Safaris select guides based on the interest you specify to us. If you have a particular request, please forward it us at the time of booking and we will do our best in selecting the Safari Guide who best matches your specifications to accompany & introduce you to Africa. Most of our Safari Guides are multi-lingual. English is the primary language spoken by all, however, most also speak French, German, Italian and Spanish as secondary languages. If you have a particular language request please inform your Safari Specialist when booking your safari. "I belong to the Kikuyu tribe, and was born along the slopes of the Ngong Hills in 1973. I am married,with two sons. My Tourist interest started when i was a small boy, herding with my grandfather - the first man to work with Karen Blixen in her farm as a guard in charge of protecting the wildlife from poachers. My interest in tourism further developed in Secondary school, when i joined the Wildlife Clubs of Kenya. Later, i served as a School leader for four years in this organization. Keen on making my enthusiasm a profession, i enrolled for a course in Mechanics at the Nairobi Polytechnic and succesfully acquired a certificate in Mechanical craft. Having this knowledge in Mechanics proved to be an important factor in my work as a Safari Guide. Later, i attended French courses for tour guiding at Alliance Francais and worked with French Clients. Further to this, i have a KPSGA [Kenya Professional Safari Guides Association - an organization devoted to improving the quality of guiding services in Kenya] Bronze badge to qualify as a professional Safari Guide. Having been in the tourism industry for the last 8 years, i continue to learn and study about all that East Africa has to offer." - John M.
"I was born on 3rd July 1966 in the Ngong Hills, famous for the film 'Out Of Africa'. I am married with two children, and belong to the Kikuyu tribe, the largest ethnic group in Kenya. My wife is a Maasai, one of the most popular tribes in Kenya known for their interesting culture as well as for conserving wildlife. This has taught me a great deal on the Maasai culture and traditions. My passion and interest in wildlife goes back to when I was in Primary school when I joined the Wildlife Clubs Of Kenya. In 1996, my strong interest in wildlife led me to join the Friends of Conservation - a non-governmental wildlife conservation organization. During this time, I was based in the Masai Mara Game Reserve for over three years, the main area of operation being the ecological monitoring, animal and habitat protection, and rhino monitoring. This program was conducted in conjunction with the Word Wildlife Fund, and we educated the local community and schools about wildlife. For this work, I was awarded with a certificate of Merit and recognition for contribution to and participation in the protection of wildlife and its' environment as a Conservation Action Leader. I later joined the Utalii College for a course sponsored by the European Union which helped me learn about Tourism Fundamentals of Wildlife conservation and ecology and also guiding techniques. I also attained the Kenya Professional Safari Guide Association Bronze badge. My hobbies are traveling, music and I enjoy meeting people from around the world. Having worked with Professional Photographers and Film Production crews, I appreciate the challenges that go with helping them during their job. It's important to me that people realize that wildlife is precious and that we need to conserve it now in order to have it in the future..." - John N.
We have some of the best Professional Guides working with us in South Africa. Rigorously trained and exceptionally experienced, our South African guides offer unmatched wildlife tracking skills. Passionately committed to conservation, they are also licensed safari professionals, offering safety, security and total professionalism. They are backed up by professional support staff at our Partner offices in Namibia, Botswana and Victoria Falls.Our Partner guides and rangers in Southern Africa are renowned for their professionalism and heartfelt enthusiasm for this continent and their field of work. We work with over 200 full-time rangers, guides and trackers in six countries across Africa. Some of them lack formal education but possess rich knowledge and skills that are not easily taught. 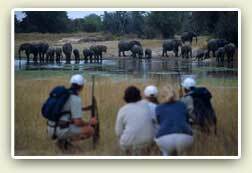 Most of the Southern African guides have participated in guide training & bush skills at the Phinda Private Game Reserve. Should you require specialist guides, we will assign a suitably qualified guide or source a specialist if requested in advance.